Sunday afternoon’s second and last racing card at the 2016 Du Quoin State Fair is in the history books with its fastest mile of the meet coming in the final race. It was delivered in the $21,000 Dudley Hanover stake for state-bred three-year-old fillies by Nicole Potts’ Royale Rose and his driver Matt Krueger. The winning time of 1:51.2 also shaved a full second off the gelding’s previous best mile for the son of Ashlee’s Big Guy, trained by Lyle Scurlock. Plagued by some poor racing luck in a number of ICF stake eliminations or finals, this time Royale Rose got an up-close and care-free mile and took advantage of it, pulling away by one and one-quarter lengths over the second place finisher Caffeine Kid. 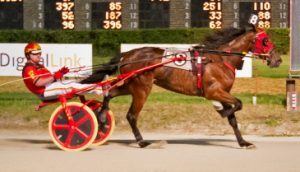 Royale Rose came to Du Quoin with only one win in 10 season starts but had five second place finishes and with some better racing luck could have made a stop at a winner’s circle a few more times. 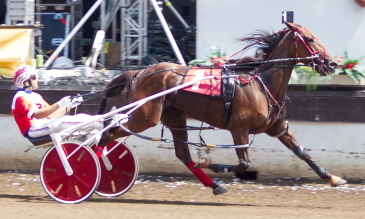 With a little over a dozen 2-year-old pacing colts or geldings passing the entry box for Sunday’s Governor’s Cup the stake was split into a pair of $`11,500 divisions. Gabe Henry got back on the winning track in the first one, taking advantage of a not-to-hasty front-end trip provided from driver Todd Warren that saw the Tom Graham Jr. trained freshman pacer stroll to a slow 59.3 half mile time. The six-horse field bunched-up with a modest 29 third quarter however Gabe Henry had no trouble holding on at the end of a 1:56 flat mile for Salem, Illinois owner and breeder Carol Graham. The son of Henry Clay won for the sixth time in eight career starts. Causway came up the inside to be second. 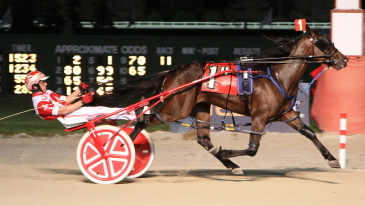 The race nine favorite Fox Valley Inferno took the field to a 59.3 half but didn’t have it down the lane. Instead it was Fox Valley Reggie who had his motor running full throttle, powering past the early leaders and winning in 1:55.3 at a $20.20 mutuel. Fox Valley Herbie came on for second and Tiny Jim rallied for third. The Yankee Skyscraper freshman Fox Valley Reggie won for the fourth time this season and stamped himself as a threat for the this Saturday’s fourth leg of the Incredible Finale Series at Hawthorne and a possible starting berth in the $100,000 Championship on September 10. After her four-race winning streak was snapped at Springfield Trixie’s Jethro may have started a new one with an easy front-stepping victory in the $23,000 Darn Safe stake for ICF freshman trotting colts and geldings. Driver Jared Finn moved the heavy favorite to the front at the 28.4 first quarter and backed things down in a big way by getting the son of Cassis to the half in an unhurried time of 1:01 flat. Another soft third quarter, this one in 31.3, enabled Trixie’s Jethro to pretty much coast to a 2:00/2 winning mile for owner and breeder Charles Doehring of Brownstown, Illinois. Trixie’s Jethro, a half-brother to Saturday’s stake champion Captain Greedy, is now 7-for-9 in his first campaign for the John D Finn Stable. The $7,000 ICF Aged Male Pace Championship turned out to be a quarter of a mile dash for the cash with the pacesetting Cole Heat holding on by a long nose over the favorite Dinky Dune thanks to the winner’s very rapid 26.1 last panel. Driver Ridge Warren took advantage of leaving from the rail with Cole Heat and put the Ray Hanna trainee on top and nicely rated the 6-year-old gelding to a rather soft 58.3 half, hoping the Huge Lake Lacey owned and bred pacer would have a lot left for the stretch drive. Cole Heat did and he needed to because the pocket-horse Dinky Dune (Pat Curtin) was also full of pace and just missed at the end of the 1:53.3 mile. The $7,000 Aged Mare Pace showdown went the same way as it did at Springfield with Fox Valley Charm proving best but this time it wasn’t a seven-length romp but a much closer half-length decision. Casey took Fox Valley Charm to the front at the 29.3 first quarter and was on cruise-control to the half, reached in a modest time of 58.3, The second half of the mile went much quicker, almost four second faster (54.3), and the Rodney Freeze trained 4-year-old mare needed a swift 26.4 last panel to hold off a game effort by Incredible Filly (Pat Curtin). The 1:53.2 mile was the fourth season win for the Yankee Skyscraper mare owned by Peter Karras of Sherman, Illinois.